A Target Pool resource defines a group of instances that receive incoming traffic from forwarding rules. When a forwarding rule directs traffic to a target pool, Google Cloud Load Balancing picks an instance from these target pools based on a hash of the source IP and port and the destination IP and port. See the Load distribution algorithm for more information about how traffic is distributed to instances. Note: If you intend your target pool to contain a single virtual machine instance, you should consider using the Protocol Forwarding feature instead. Target pools can only be used with forwarding rules that handle TCP and UDP traffic. You must create a target pool before you can use it with a forwarding rule. Each project can have up to 50 target pools. A target pool can have only one health check. Network load balancing only supports httpHealthChecks. Network load balancing supports Cloud Load Balancing Autoscaler, which allows users to perform autoscaling on the instance groups in a target pool based on CPU utilization or custom Stackdriver Monitoring metrics. For more information, see Scaling based on network load balancing. [Required] The name of this target pool. The name must be unique in this project, from 1-63 characters long and match the regular expression: [a-z]([-a-z0-9]*[a-z0-9])?, which means the first character must be a lowercase letter, and all following characters must be a dash, lowercase letter, or digit, except the last character, which cannot be a dash. [Optional] A user-defined description of this target pool. [Optional] An optional list of health checks for this target pool. Only one health check can be attached to a particular target pool. See Health checking for more information. 5-tuple hashing, which uses the source and destination IPs, source and destination ports, and protocol. Each new connection can end up on any instance, but all traffic for a given connection will stay on the same instance, if the instance stays healthy. 3-tuple hashing, which uses the source and destination IPs and the protocol. All connections from a client will end up on the same instance as long as they use the same protocol and the instance stays healthy. 2-tuple hashing, which uses the source and destination IPs. All connections from a client will end up on the same instance regardless of protocol as long as the instance stays healthy. 5-tuple hashing provides a good distribution of traffic across many virtual machines. However, a second session from the same client may arrive on a different instance because the source port may change. If you want all sessions from the same client to reach the same backend, as long as the backend stays healthy, you can specify CLIENT_IP_PROTO or CLIENT_IP options. In general, if you select a 3-tuple or 2-tuple method, it will provide for better session affinity than the default 5-tuple method, but the overall traffic may not be as evenly distributed. Fragmented UDP packets: If you are load balancing UDP traffic that is likely to be fragmented, set session affinity to CLIENT_IP_PROTO or CLIENT_IP. Do not use NONE (5-tuple hashing). This is because UDP fragments other than the first one do not carry the port number, and the load balancer may drop the fragments without the port. See Load balancing and fragmented UDP packets for more information. Caution: If a large percentage of your clients are behind a proxy server, you should not use CLIENT_IP_PROTO or CLIENT_IP. Using them sends all traffic from those clients to the same instance. If a primary target pool is declared unhealthy (falls below the failover ratio), traffic will be sent to healthy instances in the backup pool. 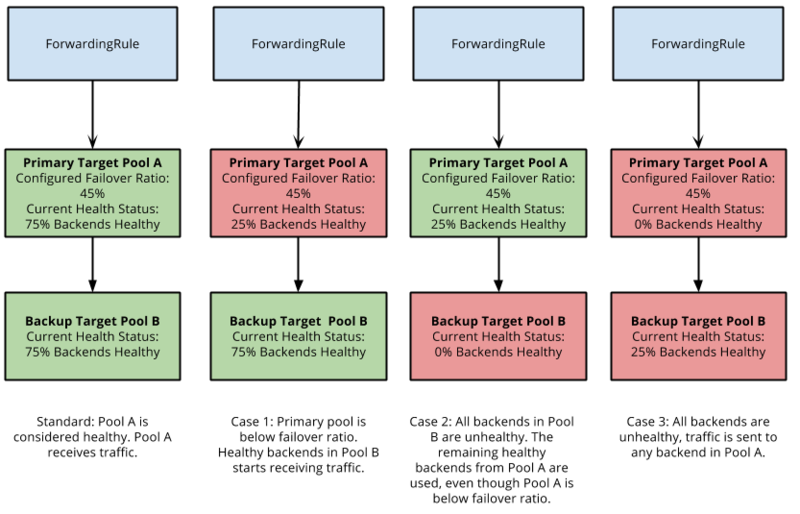 If the primary target pool is declared unhealthy, but there are no remaining healthy instances in the backup pool, traffic is sent to the remaining healthy instances in the primary pool. If the primary pool is unhealthy and there are no remaining healthy instances in either pools, traffic will be sent to all instances in the primary pool so as to not drop traffic. If the primary pool doesn't contain any instances, and none of the instances in the backup pool are healthy, traffic will be sent to all instances in the backup pool so as to not drop any traffic. At most, only one level of failover is supported. For example, if target pool A has backup pool B and back pool B has a backup pool C, then traffic intended for target pool A can only reach up to backup pool B and not C.
Note: If you intend to use backup target pools, you should set up health checks as backup target pools will not work correctly without health checks enabled. [Optional] A float between 0.0 and 1.0, which determines when this target pool is declared unhealthy. For example, if this value is set to .1, then this target pool is declared unhealthy if the number of healthy instances is below .1 (10%). If the failover ratio is 0.0, then at least one backend must be healthy for the pool to be considered healthy. If the failover ratio is set to 1.0, then all instances must be healthy for the pool to be considered healthy. You must define this if you define the backupPool field. Note: If you remove an instance from a target pool without draining it first, you will break all TCP sessions to that instance. To remove an instance safely, first drain the instance by having it fail its health check. After TCP sessions close naturally, remove the instance from the pool. For more information, see the API reference documentation for the targetPools.addInstance and targetPools.removeInstance methods. For more verbose output, use the describe command and specify a pool name. The command returns the health status as determined by the configured health check, either healthy or unhealthy. To delete a target pool, you must first make sure that the target pool is not being referenced by any forwarding rules. If a forwarding rule is currently referencing a target pool, you must delete the forwarding rule to remove the reference. Health check objects are standalone, global resources that can be associated or disassociated from any target pool. If a target pool has no associated health check, Google Cloud Load Balancing will treat all instances as healthy and send traffic to all instances in the target pool. However, if you query for the health status of a target pool without a health check, the status will return as unhealthy to indicate that the target pool does not have a health check. We recommend that your target pools should have associated health checks to help you manage your instances. For more information, see the API reference documentation for targetPools.addHealthCheck and targetPools.removeHealthCheck. When you first create a target pool, you can choose to apply a backup target pool that receives traffic if your primary target pool becomes unhealthy. If you have never set up a backup target pool before, you should also set up health checks for the feature to work correctly. Note: If your target pool currently has the sessionAffinity field set, resizing the target pool could cause requests that come from the same IP to go to a different instance initially. Eventually, all connections from the IP will go to the same virtual machine, as the old connections close. If you define an empty target, or do not define a failover ratio, the backup pool behavior will be disabled for this target pool. For more information about target pools, see the API reference documentation for targetPools.setBackup.